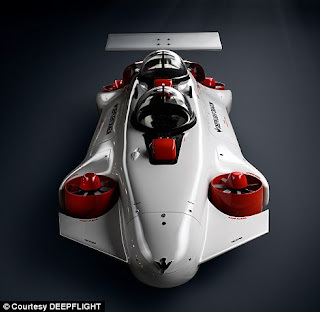 There’s a submarine on the market that looks like it was made for James Bond and doesn't require military training to operate. DeepFlight, known for taking underwater travel to new levels, has announced the latest addition to its family of vehicles, the Dragon. This $1.5 million two-person submarine hovers and glides effortlessly beneath the deep blue sea, while cruising at 4 knots. ‘The all-electric Dragon is the only personal submarine that has enough power to rely solely on vertical thrust to dive, eliminating the complexity of the ballast systems that all competing submersibles use to get heavy and sink to depth,’ DeepFlight said. 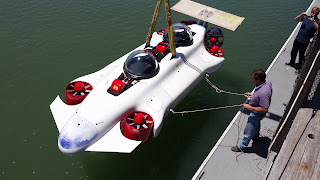 Like all its vehicles, the Dragon was developed with fixed positive buoyancy, meaning it will always float up to the surface if power is lost. What makes this model unique is the DeepFlight Dive Manager (DDM), a proprietary technology that monitors and manages crucial functions. This feature allows even those with no experience to pilot the submarine and provides the ability to set the depth limit on any particular dive. 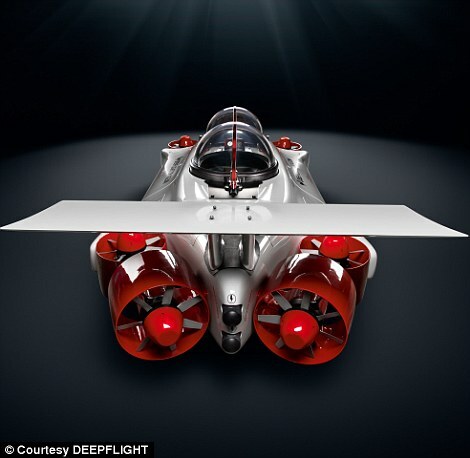 DeepFlight added four rotating engine pods to the build, which enables the craft to fly and steer like a quadcopter – just under the water. The hovering capabilities gives riders the freedom to cruise alongside whales or stop and hover over ancient underwater ruins. 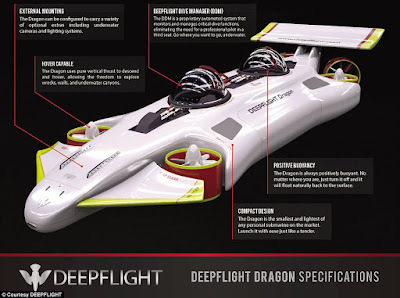 The Dragon is powered by advanced lithium iron phosphate batteries, which gives riders six hours of underwater exploration and only two hours is needed to recharge. A pressure cabin protects riders from ‘the bends’ and a light-weight-yet-ultra-strong carbon composite chassis makes the Dragon a beast. Even though this submarine is safe and just about unsinkable, there are hidden floatation capsules dotted around the craft that will turn the watercraft into a floating device. There is also extra oxygen supplies in case of serious emergency. At 16 feet 5 inches long, 6 feet 3 inches wide and weighing 4,000 pounds, the Dragon is able to fit on most yachts, with little or no retrofit required. The company also provides custom integration services, including a launch and recovery solution with purchase.